In the first part of this lecture series, we discussed the theories behind AED and how it can help increase survival rate of victims of sudden cardiac arrest. Here, we will have an overview on how to use an AED during an actual emergency. Although AEDs are intended to be simple and easy to use, it is recommended that you complete first aid or basic life support training before you attempt to use any type of defibrillators. Many public and private places now have portable defibrillators that are accessible to the public. The increased accessibility of AEDs to the public hopes to increase survivability rates of victims of sudden cardiac arrest. The pictures shows St Mark James training equipment for CPR. 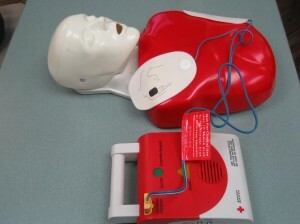 This equipment includes a mock AED trainer which is almost identical in appearance to a real AED. Follow the general steps of first aid treatment, such as checking for consciousness, activating emergency medical services, and assessing the ABCs of life (Airway, Breathing and Circulation). If there is no pulse and breathing, and there is an available AED, you can decide to use it. Usually, AEDs come with step-by-step directions that you can find inside the storage. Do not unpack or remove an AED from its storage, if you do not intend to use it. Before opening the AED, remove the clothing of the victim to expose the chest wall. Here are the general instructions for use of AED. Open the AED: You can find a latch on either sides of the AED to open it. Then, find the switch or button which should be clearly marked. Switch the AED on. Locate for the electrode pads: Depending on the version of the AED, you may have to unwrap or open the pads or pull a handle. The pads should be kept attached to the device. Prepare the electrode pads: One side of the electrode pads may be sticky that stick with person’s chest wall. Remove the paper backing to expose the sticky surface of the pad. Prepare the victim: Make sure that the chest well is clear of cloths, medicine patches, jewelry and other accessories that might get burned with the electrical shock. Wipe the skin dry to ensure the pads stick. If the person is submerged in water, bring him to a safer, dry place. Make sure that the chest wall is dry before applying the pads. Stick the pads over the chest: Never apply a pad over an implanted medical devices such an artificial pacemaker. Position one pad on either the right or left side of the upper part of the chest, toward the midline and below the collarbone. The other pad should be placed on the opposite side, slightly lower and to the side of the breast. You can also position a pad over the ribcage on the opposite side. The AED interprets the heart rhythm and then administers a shock if needed. Initiate CPR: After defibrillation, the person’s heart momentarily stops, allowing it to reset and achieve normal heart rhythm. By immediately starting CPR, you can restore heart rhythm. Continue performing CPR until ambulance arrives or the person responds. It is important that you know CPR and basic life support for increased chances of survival.